I’m a sucker for a restaurant with a patio. And happy hour. I love a happy hour bargain. La Bodega delivers on both counts. Half price drinks, including sangria (even by the pitcher) and tapas are offered from 2 to 6 PM Monday-Friday, 2 to 4 PM on Saturday and 4 to 6 PM on Sunday. The menu at La Bodega has items clearly labeled gluten-free and/or vegetarian. It makes ordering easy for me. It’s still a good idea to confirm with your server and let them know if you have a medical necessity to be gluten-free. 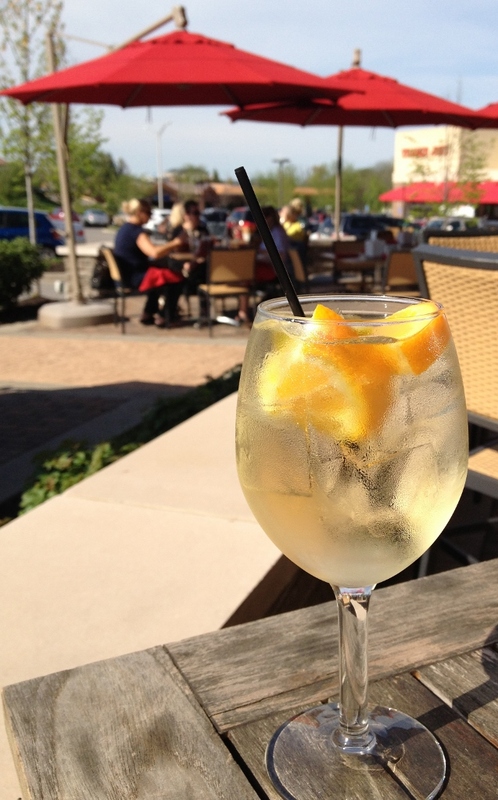 For a recent early dinner, I had sangria with white wine. During happy hours, you can get pitchers for around $15! While not on the special price happy hour menu, I almost always get the Aceitunas Alinades. 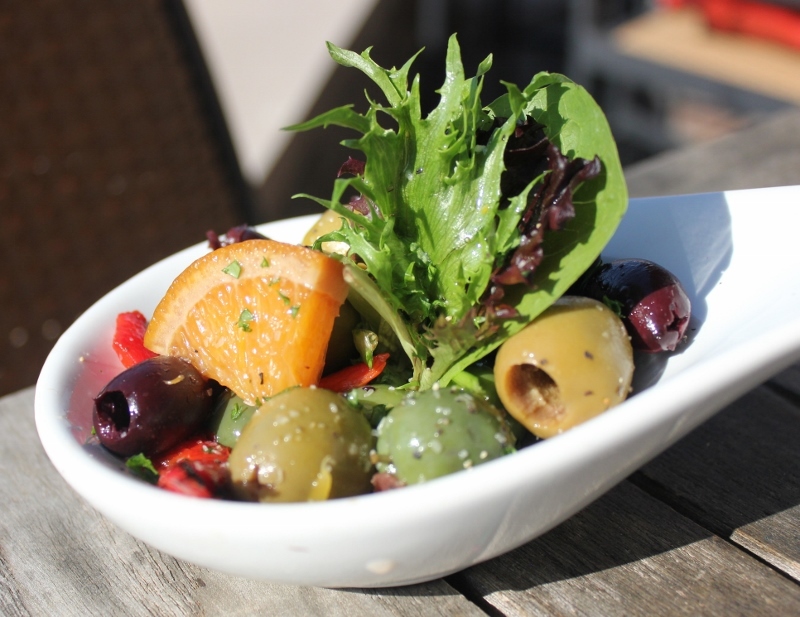 La Bodega’s house marinated olives with spices and fresh herbs is one of my favorite indulgences. Another of my favorites is Champinones a la Plancha. 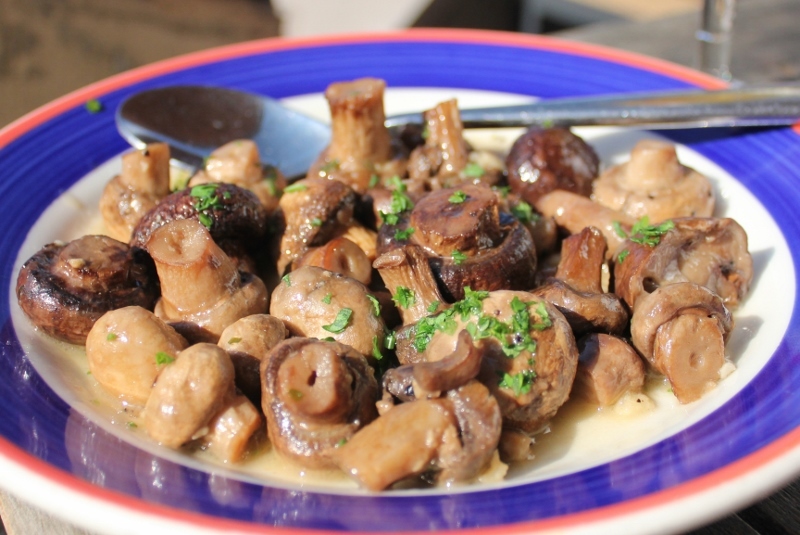 Roasted mushrooms with garlic and white wine-parsley sauce makes a hearty addition to the meal. The sauce is rich, the mushrooms perfectly roasted and just the right amount of garlic to know it’s there without overpowering the other ingredients. The Espinacas de Catalanas is an interesting take on spinach. 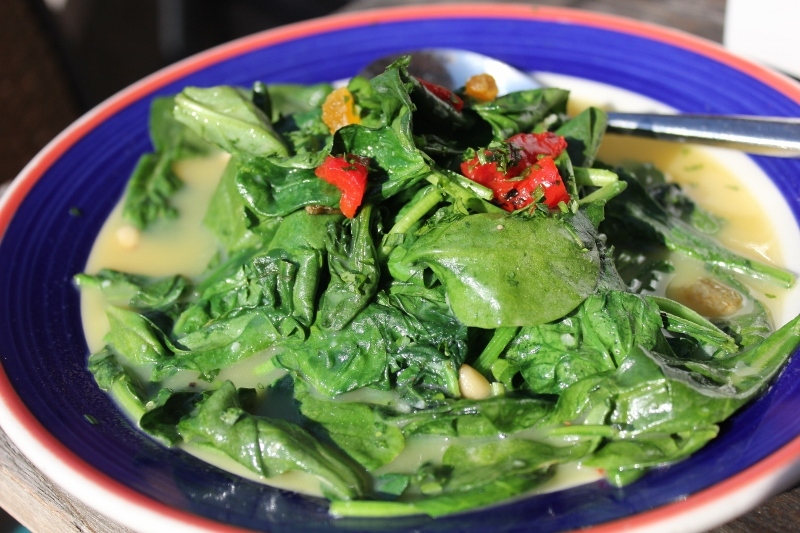 For those who aren’t fans of cooked spinach, this dish could change your mind. And it’s also surprising to have orange juice used in a hot dish. In addition to the spinach and orange juice, this dish includes raisins, apricots and pine nuts. 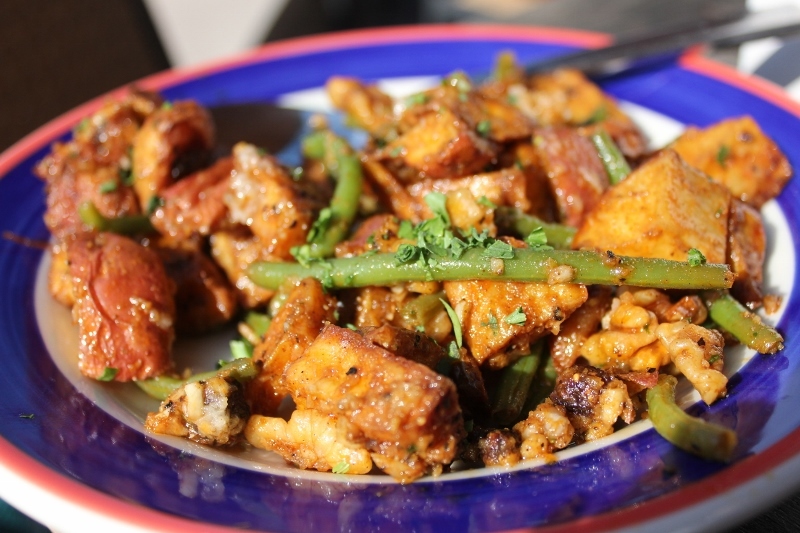 Judias Verdes, which includes roasted potatoes, green beans and figs in a walnut-fig dressing, is a hearty dish. I think this would make a small meal for one person, it’s a generous serving. I’ve got one more dish to share with you, but must warn you I cannot get verification on how it is cooked. While listed as gluten-free, it is flash-fried. I have tried twice to get confirmation on how it is cooked and received conflicting information. If you are gluten-free by medical necessity, I suggest avoiding this dish. 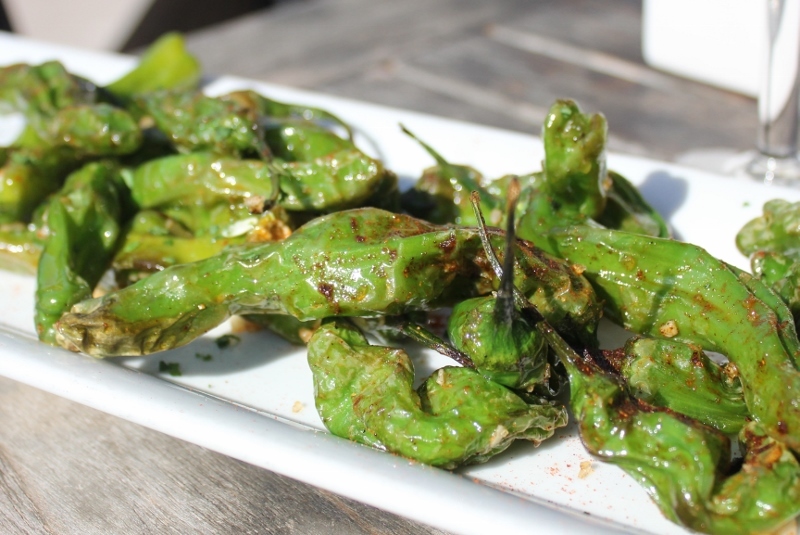 Pimientas de Shoshito featurees shoshito peppers tossed with smoked Spanish paprika and sea salt. Each time I’ve dine with others who have had this dish, they ooooh and ahhh about it. If I can confirm how it is cooked, I’ll update here so we can all enjoy it! La Bodega has two locations in the KC area. The original location is at 702 Southwest Blvd., Kansas City, MO, 816.472.TAPA. 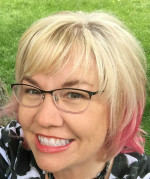 The location featured in this post is located at 4311 W. 119th Street, Leawood, KS, 913.428.TAPA. Eat With: moderate caution. As mentioned above, I was unable to confirm the cooking method of one dish labeled as gluten-free. The menu has dishes that contain no gluten ingredients clearly labeled.